OMG what a cool card! Congrats to your daughter! Thanks so much for joining in the fun at our Double D ‘Let’s Pop a WHEELie’ challenge! Good Luck and we hope you’ll come back often. 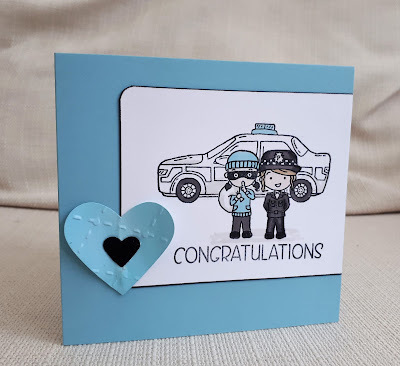 Such a fun card, great masking and love the limited colour palette x. Happy engagement to your daughter x. Well they will love this! Congrats to your daughter! What a fun card that I am sure will be treasured!! Thank you for joining our challenge at Double D! Congrats to the happy couple. This card looks awesome and it sounds like the theme is spot on for them. Aww, this is so sweet and fun. Blue is the perfect colour for a police officer. Congrats to your daughter. They will love this! Thank you for joining us at Less is More. x.